SINCE DONALD TRUMP was elected president, received wisdom has it, big business has run rampant in Washington, DC. The chief-executive-in-chief has filled his cabinet with fellow plutocrats, executives and, horrors, lobbyists. One who used to represent the coal industry runs the Environmental Protection Agency (EPA). The acting interior secretary, David Bernhardt, risks so many potential conflicts of interest from his previous life lobbying for energy and natural-resources firms that he carries around a card listing all 22 of them. Last year businesses spent more than $3.4bn advancing their interests in the halls of government, 8.5% more than before the self-styled “CEO president” took office (see chart 1). The health-care, finance and industrial sectors each splurged over $500m. Yet these sums may reflect not how easy life is for corporate America in Mr Trump’s Washington, but how difficult. The Chamber of Commerce, which has had the ear of every president, has successfully championed massive corporate-tax cuts but failed to dissuade the president from imposing tariffs and curbing immigration. Big Pharma, which had managed to raise drug prices regardless of which party controlled the White House, is being pressed by Mr Trump to lower them. Big Tech has three firms among the ten biggest spenders on lobbying—Alphabet, Facebook and Amazon—but few friends in Washington, not least because Silicon Valley has been critical of the president, often vocally so. 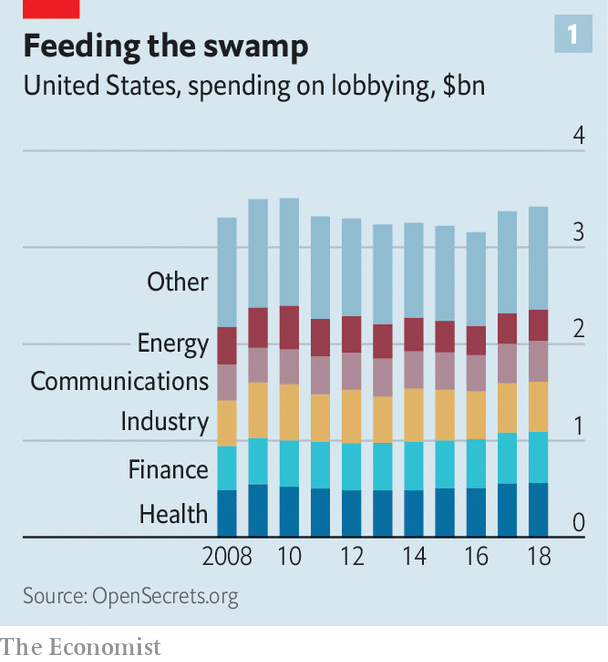 An interrogation of data and, mostly on the condition of anonymity, of lobbyists from across the political spectrum confirms that advancing corporate interests in Mr Trump’s Washington is no easier than under previous presidents. In some ways, it has got harder. 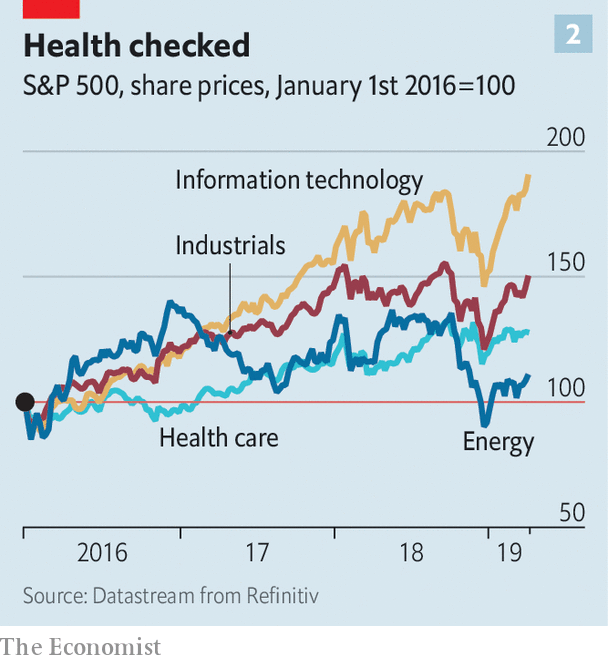 And its results, gauged by firms’ stockmarket performance, are ambiguous. Tax cuts have helped fuel a bull market in equities. But health care, which spends more than any other industry, has lagged behind (see chart 2). One reason is that there is more to lobbying than buttering up the administration. As one veteran lobbyist notes, “80% of what business cares about is in the ambit of Congress.” Lawmakers, meanwhile, have grown charier of business folk. And not just left-leaning Democratic representatives swept onto Capitol Hill in November’s mid-term elections; high drug prices have so angered ordinary Americans that even previously reliable Republican allies in Congress can no longer protect pharmaceutical firms. Tech firms are out of favour on both sides of the aisle. Gone are the days when a well-connected fixer could have a discreet word with a committee chairman and make a client’s problem go away. Social media mean no more “quiet issues”, says Tony Fratto, a former senior official in George W. Bush’s administration and now an adviser at Hamilton Place Strategies. More counterintuitively, currying favour with Mr Trump’s supposedly business-friendly administration is no picnic, either. Lobbyists cite four main reasons. First, the president is an outsider. “Trump owes nothing to us,” explains one of Big Pharma’s top lobbyists. Nor do many of his appointees. Mr Trump rejected experienced Republicans who had not supported his candidacy, confides a senior financial lobbyist whose paymaster is an ardent Trump supporter. As a result, his administration is full of unknown entities. Many, it is true, are business-friendly, especially compared with Barack Obama’s big-government-loving lieutenants. But, and this is lobbyists’ second headache, this must be weighed against the Trump bureaucracy’s inefficiency. People are promoted for fealty to Mr Trump, not competence, which puts off many Republican technocrats; two years into the president’s term, a record number of jobs across the executive branch remain unfilled. “You don’t take every issue to the White House,” notes Thomas Donahue, the long-serving head of the Chamber of Commerce. On most, lobbyists must try to win over other officials. The top lobbyist for a big technology firm struggles to find out who is working on given issues and how to reach them to build connections. Sometimes, he says, it is difficult to tell if anyone is working on them at all. James Connaughton, a senior environmental official in George W. Bush’s administration, calls Mr Trump’s unceremonious rollback of environmental rules “not deregulation but non-regulation”. Anarchy is bad for business. Third, respectable businesses promoting their legitimate interests worry about being sullied by association with Mr Trump’s entourage, or his views. His campaign manager and personal lawyer have been sentenced to prison terms. The president himself is under investigation for alleged campaign-finance violations. A veteran lobbyist turned unregistered influencer is convinced that “everything will be investigated at some point”. She makes sure all her contacts with government are above board. Mr Trump’s opinions, meanwhile, do not necessarily reflect the interests of corporations. His anti-environmentalism has helped some polluters, particularly in his beloved coal industry, but provoked unease among big firms. Carmakers and large utilities both oppose laxer rules, which could backfire. A conservative lobbyist takes pains to distinguish his blue-chip clients from small-time coal firms seeking cronyistic carve-outs from the EPA. Several corporate-advisory councils to Mr Trump’s administration disbanded in the wake of his refusal to condemn white supremacists. Get close to the president, sums up Mr Fratto, and “you take on all of the baggage of Trump”. Finally, the intrigue of the Trump White House would baffle a Kremlinologist. A lobbyist for a leading private-equity firm warns that power there “shifts around very quickly”. Boutique lobbying shops have mushroomed, as under every new president. These claim to offer access, observes a former Republican heavyweight turned lobbyist, “but lack substance”. In any case, only a handful of Mr Trump’s closest advisers carry any clout with their boss. Chief among them is Jared Kushner, his son-in-law, whom one lobbyist describes as “the last guy to put the president to bed”. Even so, Mr Trump can catch out top aides with tweets born of gut feelings. “How do you lobby Trump’s gut?” grumbles an environmental lobbyist with experience in the Clinton administration. Lobbyists are not short of ideas. Some use hyper-targeted advertising to reach the president as he watches Fox News or retreats to his Mar-a-Lago resort in Florida, according to a recent exposé by the Washingtonian, a magazine. T-Mobile, a telecoms firm, recently admitted to spending $195,000 at Mr Trump’s hotel near the White House, with executives reportedly sporting bright pink shirts emblazoned with the firm’s logo. Others advise clients to find a way to create jobs and to let the president take credit. A lobbyist for the lobbying industry warns that firms can no longer be too critical of the president, lest he unleash a withering tweet. But, he says, you can appeal to Mr Trump via Snapchat or Twitter. To reach the president, “you’ve got to make him the hero of your story,” counsels a seasoned Democratic lobbyist. Some bosses, for their part, are getting more personally involved with the president, risk to reputation notwithstanding. “Trump wants to hear directly from business leaders,” says a former adviser to the president, whose administration he calls “the most CEO-friendly” ever. A Democratic operative agrees, noting the difference between Mr Trump and Mr Obama’s posture of “we know what’s best for the American people”. A Republican member of one of Mr Trump’s disbanded CEO councils recalls how past administrations’ meetings with bosses “felt perfunctory”, whereas now “they seem to pay attention and seek company input”. When in late March Mr Trump addressed the Business Roundtable of America’s biggest firms, Jeff Bezos, boss of Amazon, joined for the first time, even though Mr Trump had mocked him on Twitter as Jeff Bozo. The “swamp” of Washington has not been drained, as Mr Trump implausibly pledged to do in his campaign. In some ways, concedes Anthony Scaramucci, a Trump loyalist who briefly served in his White House, it “has gotten extra swampier”—a state of affairs he blames on both Democrats and Republicans. Unregistered “strategic advisers” began replacing registered lobbyists, whose number has fallen from 14,000 to 11,500 in a decade, before Mr Trump came along. Sheila Krumholz, head of the Centre for Responsive Politics, an independent watchdog that monitors lobbying trends, worries about influence-peddlers “trading on only whom they know and not what they know”. Disclosure requirements remain weak and poorly enforced. Hyper-partisanship in Congress makes the House Democrats’ sweeping anti-corruption bill, which was passed in March and, among other things, would tighten rules on lobbying, unlikely to clear the Republican-controlled Senate. Swampier does not necessarily mean better for corporate America. It does, though, benefit the lobbying ecosystem’s endemic species, which thrive on chaos. Haley Barbour, a former governor of Mississippi, ex-chairman of the Republican National Committee and one of Washington’s most influential lobbyists, praises Mr Trump’s tax cuts and deregulation efforts. Even so, he warns, “the next reform might not be good for your firm, so you need somebody advocating your position to the White House.” A friendly swamp creature will be there to help.